STRAY Buspass - LOT Laos · Kambodscha · Thailand U.A. Stray ist das flexible Reisenetzwerk für Weltenbummler jeden Alters in Südostasien. Getreu dem Motto “Get further off the beaten track” kommst du in den Genuss einzigartiger, authentischer Abenteuer an Orten jenseits vom Massentourismus und erlebst die lokale Kultur hautnah. Natürlich dürfen auch die Top-Highlights der besuchten Länder nicht fehlen. Mit den flexiblen Buspässen profitierst du von maximaler Freiheit und Gestaltungsspielräumen sowie der Chance, auch Gebiete abseits der üblichen Routen zu erkunden, die nicht mit öffentlichen Verkehrsmitteln erreichbar sind. Reisen mit dem Stray Buspass sind bequem, gut organisiert und stressfrei. Begleitet werden die Etappen von erfahrenen und gut ausgebildeten Reiseleitern. Diese zeigen dir die besten Plätze zum Essen, Trinken, Shoppen und organisieren für dich Ausflüge und Aktivitäten. Die Übernachtungen sind nicht im Buspass inklusive und können unterwegs direkt über den Reiseleiter gebucht werden. An jedem Übernachtungsort ist ein Bett für dich reserviert, so dass du für die erste Nacht sicher ein Dach über dem Kopf hast. Es besteht ein Netz von einzigartigen Unterkünften, von denen einige exklusiv für Stray-Traveller reserviert sind. Eine Besonderheit sind die Aufenthalte bei einheimischen Gastfamilien, bei denen du am echten Dorfleben teilnimmst. Du kannst an jedem Ort entlang der Reiseroute so lange verweilen wie du möchtest und einfach weiterreisen, sobald du dazu bereit bist. Der Transport erfolgt in eigenen Stray-Reisebussen, die sicher, zuverlässig und pünktlich sind. Entdecke Südostasien mit großer Flexibilität und in deinem eigenen Tempo. 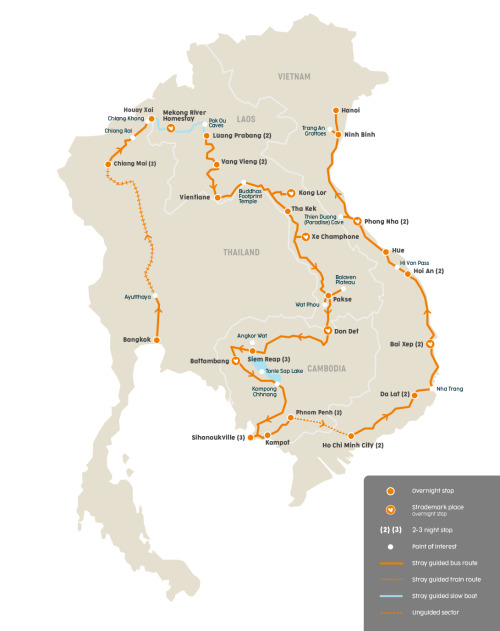 Der LOT Buspass ist für Traveller mit mindestens sechs Wochen Zeit eine umfangreiche Reisemöglichkeit, um Thailand, Laos, Kambodscha und Vietnam von Bangkok bis nach Hanoi intensiv zu erkunden. Der Lot-Pass beinhaltet 4 Länder voller verschiedener Abenteuer und Kulturen - komm an Bord und erlebe die Zeit deines Lebens! Übernachtungen sind nicht im Buspass inklusive. In jedem Übernachtungsort gibt es für die erste Nacht garantierte vorreservierte Hostels. Die Buchung kannst du unterwegs über den Reiseleiter vornehmen. Eine Übernachtung kostet ca. US$8-12 pro Nacht (Mehrbettzimmer). Doppel- und Einzelzimmer sind ebenfalls buchbar (ca. US$28-60 pro Nacht). Die Zahlung erfolgt direkt in der jeweiligen Unterkunft. Eine Liste mit den STRAY-Unterkünften in allen Übernachtungsorten entlang der Route schicken wir dir gerne zu. An diesen Unterkünften ist auch der Abfahrtsort des Busses. Wenn du in einer anderen Unterkunft übernachten möchtest, ist das überhaupt kein Problem - bitte finde dich in diesem Fall pünktlich vor Abfahrt wieder in der STRAY-Unterkunft ein. Eine Abholung von anderen Unterkünften wird nicht angeboten. Du kannst den Buspass auch inklusive Übernachtungen und weiterer Ausflüge buchen, wenn du nur eine begrenzte Reisezeit hast und dich vor Ort um nichts kümmern möchtest. Details hierzu findest du unter "Zusatzinformationen". - sind erfahren und gut ausgebildet. - Schlagen kulturelle Brücken und bieten echten Mehrwert in abgelegenen Gebieten. - Teilen persönliche Erlebnisse und bieten authentische Erfahrungen. - Zeigen dir die besten Orte zum Essen, Trinken, Schlafen und Einkaufen. - Bekommen fortlaufend Schulungen und wissen, was zu eurer Reisezeit up to date in der Region ist - Reiseführer in Buchform können dann schon veraltet sein. Eine Übersicht über mögliche optionale Aktivitäten während der Tour schicken wir die auf Wunsch gerne zu. Kontaktiere uns einfach! Welcome to Stray! Your adventure kicks off in the buzzing Asian metropolis of Bangkok, Thailand. If you arrive early in the day feel free to check out the vibrant markets and ancient temples that make up only a small side of this multifaceted city. Be at our Stray Shop on Khao San Road at 6pm to meet your Tour Leader and your new travel mates for a Welcome Night introduction. We’ll cover how Stray works, answer any questions you have and make sure everyone is ready for tomorrow morning’s departure. Afterwards, you can grab a delicious Thai dinner and a few cold beverages on Khao San Road. Meet your Tour Leader back at the Stray Shop in the morning to depart for the UNESCO World Heritage site of Ayutthaya. We arrive mid-morning, allowing plenty of time to explore the ‘Venice of the East’ by bike or boat. Ayutthaya is the former capital of the Siamese empire and was once a grandiose city, but many of the ancient monuments were ruined when it was attacked by the Burmese in 1765. Nevertheless, it is still a fascinating historical park that offers a glimpse of bygone splendour. This afternoon we board our overnight train and head for the city of Chiang Mai. We arrive into Chiang Mai train station between 8am – 11am. Chiang Mai is a popular place to hop off for many travellers and an amazing city full of endless activity options, such as Thai cooking classes, bike tours or Muay Thai kickboxing. There are over 300 Buddhist temples to discover, you can visit the old walled-city and see the Tapae Gate, pick up a bargain at the famous night market or check out the lively music scene. This morning we depart Chiang Mai to head for the Thailand-Laos border. We’ll make a stop near Chiang Rai to check out the famous and intriguing White Temple (Wat Rong Khun). Wat Rong is a unique modern Buddhist temple that features some curious statues and murals that include images from Star Wars and The Matrix, Freddie Kruger’s head hanging in the trees and a giant Predator emerging from the garden. We stop here long enough to grab a snack, stretch our legs and take a few photos before we continue on to cross the border into Laos. Once in Laos we take a short tuk-tuk ride to the smalltown of Houay Xai, our stop for the night. Note: You must hop off for these activities. Leaving Houay Xai you’ll board our private slow boat up the Mekong River to the secluded village that will host you for an overnight homestay experience. Sit back and soak up this incredible journey as you wind your way through lush farmland, thriving jungle and rugged mountain scenery, drifting past water buffalo, locals fishing, and kids splashing in the shallows. We arrive in the village in the late afternoon. Here you will get a taste of traditional Lao village life by staying with a family in their home. Experience a special Baci (welcoming) Ceremony, swim in the river, play a game of football with the kids, explore the local temple, go fishing and don’t forget to try the local whiskey. This is a true highlight of any trip to Southeast Asia and exclusive to Stray! It’s an early start as we head south through mountainous terrain on one of the most scenic journeys you’ll experience on the Laos travel route. Travel past hill-tribe villages, vast green valleys and rolling hills. Our journey today takes us to the little riverside town Vang Vieng, formerly known as the best place to take tubing trips down the Nam Song River to visit riverside bars and indulge in cheap booze. These days you can still go tubing, but now you get to enjoy the beauty of Vang Vieng's landscape without the sound of pounding bass in the background. With its stunning natural scenery, Vang Vieng offers great rock climbing and kayaking options. We also recommend hiring a bike to explore the town and visiting the Blue Lagoon, one of the best natural swimming holes in Laos. The fun doesn’t stop after an adventure filled day either! This evening, check out one of several international restaurants for a taste of home or head to one of the bars to really get the party started. This is what Stray is all about: getting totally off the beaten track! We head into the Xe Champhone wetlands - an area so remote that occasionally our Stray buses can't access it, so we have to jump on board an off-road truck. We’ll stop at Old Wat Taleow, a beautiful temple that was bombed during the Secret War and somehow the golden Buddha inside remained undamaged. Next stop is the 200-year-old Hotay Pidok Buddhist library, a fascinating stilt structure that’s home to thousands of Sanskrit scriptures and bamboo tablets. Before heading for our guesthouse in the small village of Ban Keng Kok, we stop at the aptly named Monkey Forest to get up close with curious and friendly wild rhesus macaque monkeys. Don’t forget to grab some bananas! An early start takes us to the UNESCO World Heritage site of Wat Phou, an ancient Khmer temple and the former capital of the Khmer empire before Angkor. Explore the site and climb up to the mountain top temple for some spectacular views over the reservoir. We’ll then head south to the backpacker mecca of Si Phan Don, otherwise known as the 4000 Islands. Here you can experience the laidback lifestyle and natural beauty of Laos’ landlocked islands. It’s a great place to take a boat trip to spot rare Irrawaddy dolphins, or cycle across to the neighbouring Don Khone Island to discover the remaining remnants of the only steam engine railway in Laos and marvel at the thunderous Li Phi waterfall. Say goodbye to Laos – it’s an early start for the journey into Cambodia. A short drive will bring you to the Don Kralor Border where you will complete the immigration process and continue into Cambodia. Today your destination is the small, but vibrant city of Siem Reap, best known as home to the UNESCO World Heritage listed Angkor Temple complex. Arriving in Siem Reap in the late evening there will be time to freshen up before dinner and drinks with your group along the iconic Pub Street. Today you depart Siem Reap early enough to arrive in Battambang for a late lunch. After lunch we’ll take a ride on the Bamboo Train, a rail system that was built by the French and destroyed by the Khmer Rouge, but the locals still use it as simple form of transport. Next we’ll visit a whiskey making village and learn about the local tipple, before checking out a village where they make a staple (but smelly) ingredient in most Khmer and Southeast Asian cuisine - fish sauce! Tonight we’ll stay in another little village, outside of Battambang, located in the picturesque countryside. You’ll stay in a Cambodian family’s home, experience rural community life. You can wander through the village and nearby rice paddies and finish the day by enjoying a delicious traditional meal with your host family. A full day of travel takes us from the countryside to the popular seaside town of Sihanoukville on the Cambodian coast. En-route we pass through the bustling riverside Khmer town Kompong Chhnang (pronounced ‘kom–pong–ch–nang’) and we’ll arrive in Sihanoukville by late afternoon. Wander down to the beach for a refreshing dip, kick back at one of the many beachfront restaurants and bars, join one of the beach parties or have seafood BBQ on beach. Relax in Cambodia’s premier beach location. Catch some rays on the beach and go for a swim, or do one of the many water sports including diving, fishing, snorkelling, kayaking or hire a jet ski. Learn to cook Khmer classics like Fish Amok or deep-fried bananas at the traditional Khmer cooking school, or hire a bicycle and explore the nearby beaches. Tonight, you can head to Ochheuteal Beach for some partying with the rest of the backpacker crowd, or watch the sun go down at one of the beachfront restaurants. A three-hour drive brings us to the little riverside town of Kampot where you will have a free afternoon to visit the fascinating salt and pepper farms, go cycling or trek in the Bokor National Park. There is an option to take a leisurely boat cruise on the Kampot River, where you’ll be encouraged to sit back with a refreshing cool beverage and absorb the spectacular views of Bokor National Park and Elephant Mountain as the sun sets over the river. Tonight, we recommend sampling the exceptional regional seafood dishes at one of the many restaurants on the riverfront. From Kampot we head inland for the bustling Cambodian capital Phnom Penh, stopping for lunch before we take an afternoon tour of the infamous Khmer Rouge S21 Prison and Killing Fields. While it is a very sobering experience to learn more about Cambodia’s harsh recent history, it is one of the most recommended things to do in Phnom Penh. This evening, take a walk around and discover the many sights of this energetic city or get out mingling with the locals while watching the sun set over the Mekong River. Use this free day to explore. Da Lat vaguely resembles a French town with sprawling old villas and towering pine trees. It is not on the main tourist trail so locals are curious and very friendly to Western visitors. There are plenty of adventurous activities on offer here, but many people opt for an adrenalin-packed canyoning trip where you abseil over waterfalls and jump off a 5 metre high drop into the pool below. If that’s not for you, you can visit the last Emperor’s Art Deco-style summer palace, take a motorbike tour of the city, explore the never-ending local coffee or strawberry plantations, or hire tandem bikes at the market and cycle to the Hang Nga ‘Crazy House’, an unconventional example of surrealist architecture. - Relax on the beach or feast on all-you-can-eat BBQ and beer! A coastal drive takes us to the popular tourist spot and UNESCO World Heritage town of Hoi An. Before arriving in Hoi An, we’ll stop along the way to visit the My Lai Memorial, a site that commemorates an event that marked a turning point in the American War. Hoi An is a must-see destination, with beautifully restored and preserved French Colonial architecture, funky bars, outstanding restaurants, art galleries, souvenir shops and countless tailor shops. With glorious beaches so close nearby, this is paradise! A great spot to hop off and enjoy the local nightlife, try local delicacies (and beers), then meander home through the motorbike free streets. This is where your journey with Stray comes to an end, but there is plenty to see and do in and around Hanoi. If you have some extra days to spend here, we highly recommend booking a cruise around breath-taking Halong Bay or making a trip inland to visit the hill tribes of Sa Pa. Both of these excursions can be organised for you by your Tour Leader. We hope you’ve had a blast on your great Stray adventure! 2. Wir senden dir deine Buchungsbestätigung und alle wichtigen Informationen rund um deinen Buspass. 3. Sobald du deinen Südostasien Buspass vollständig bezahlt hast, erhältst du von uns die Zugangsdaten für die "Stray Mate" Website, wo du deine Reiseroute selbstständig planen und managen kannst. Hier kannst du jederzeit alle Informationen zu deiner Reise einsehen, wie Fahrpläne, Abfahrtszeiten, Abholorte, Aktivitäten und Unterkünfte. Es ist notwendig alle Strecken des Buspasses vorab für ein bestimmtes Datum zu reservieren. Du hast natürlich die Möglichkeit, die Daten der einzelnen Streckenabschnitte jederzeit kostenfrei zu ändern. Solltest du Änderungen an den Daten bereits reservierter Strecken vornehmen wollen, so kannst du dies ebenfalls ganz bequem über "Stray Mate" erledigen. Bitte beachte, dass die Verfügbarkeit jedes Streckenabschnittes geprüft und rückbestätigt werden muss, da die Verfügbarkeit im Reisebus begrenzt ist. Wer nur eine limitierte Reisezeit zur Verfügung hat, sollte am besten alle Streckenabschnitte vorab für das tatsächlich geplante Reisedatum buchen. Wer ganz viel Zeit hat und äußerst flexibel unterwegs sein möchte, wählt zunächst ein ungefähres Datum für jede Strecke aus und sollte dann spätestens 3-5 Tage vor dem geplanten Reiseantritt den Platz im Bus buchen. Der Buspass muss ab Buchungsdatum innerhalb von 12 Monaten angetreten werden. Ab dem ersten Reisetag ist dein Buspass dann 12 Monate für die gebuchte Route gültig. 2 Abfahrten pro Woche von jedem Übernachtungsstopp. Jede Etappe dieser Route wird an zwei Tagen je Woche durchgeführt (feste Abfahrtstage). Detaillierter Fahrplan gerne auf Anfrage. Stray nutzt für die Busfahrten eigene Busse und daher können Sicherheit, Zuverlässigkeit und Pünktlichkeit gewährleistet werden. * Öffentliche Busse können dich zwar zu den zentralen Punkten bringen, jedoch kosten abgelegene Stopps oft extra oder es gibt gar keine Busse zu diesen abgelegenen Orten, wo du eigentlich gerne hin möchtest. * Öffentliche Verkehrsmittel haben oft einen geringeren Anspruch an Sicherheit, Wartung und ethnische Vorgehensweisen. * Verspätungen, ausfallende Verbindungen oder das Suchen nach der richtigen Haltestelle können nicht nur stressig sein, sondern auch ungeplante Kosten verursachen - jedoch nicht mit Stray! * Reise zusammen mit Travellern verschiedener Nationalitäten und Altersgruppen. * Das Durchschnittsalter liegt bei Ende Zwanzig. Alter spielt jedoch keine Rolle - die Einstellung zählt! * Reise mit gleichgesinnten, abenteuerhungrigen Menschen - einer der Top-Gründe, warum du Stray lieben wirst. Wenn du dich für dieses Upgrade entscheidest, profitierst du nicht nur von den Vorteilen des Buspasses, sondern genießt auch den Komfort von vorgebuchten Unterkünfte in allen Übernachtungsorten des Buspasses (1 Nacht je Ort) sowie eine Vielzahl weiterer inkludierter Ausflüge und Aktivitäten. Die Flexibilität bleibt weiterhin erhalten - du kannst immer noch überall aussteigen und längere Zeit an deinen Lieblingsorten verbringen. Das kannst du ganz flexibel unterwegs während deiner Reise entscheiden. Solltest du an einem Ort länger als 1 Nacht bleiben, dann sind die weiteren Übernachtungen extra zu zahlen. Du bist dabei frei in der Auswahl der Unterkunft und kannst diese natürlich auch eigenständig organisieren. 1. Entdecke Orte die niemand sonst kennt. Stray bringt dich an Orte, an denen keine anderen Touren oder Busse stoppen. Orte die nicht einmal so einfach auf der Landkarte zu finden sind! 2. Du reist mit erfahrenen Reiseleitern, die ihr Insider-Wissen über die Länder und ihre Kultur mit dir teilen. Die Reiseleiter buchen Unterkunft und Aktivitäten und du kannst einfach zahlen während du reist - "Pay as you go". Es sei denn, du hast eine "Flexi-Tour" gebucht. Bei diesem Paket sind bereits die Unterkunft und die beliebtesten Aktivitäten inklusive. 3. Du lernst Gleichgesinnte aus der ganzen Welt kennen und findest Freunde fürs Leben. 4. Du hast die Möglichkeit an vielen verschiedenen Orten entlang der Route aus dem Bus auszusteigen, und später wieder einzusteigen, wenn du weiterreisen möchtest. 5. Stray bietet sicheres, verlässliches und problemloses Reisen. 6. Die Bewohner und die Umwelt der Länder, die während einer Stray-Bustour besucht werden, sind von fundamentaler Wichtigkeit. Deshalb unterstützt Stray zum Beispiel die Einheimischen mit Schulprojekten. 7. Du reist nicht nur mit den Stray-Bussen, sondern auch mit dem Zug, Boot und sogar einem Tuk Tuk. 8. Es sind einzigartige Übernachtungen wie zum Beispiel in Don Det oder Koh Tunsay Island und Übernachtungen bei Einheimischen Familien eingeplant. 9. Die Reiseroute führt nicht einfach nur direkt von A nach B, stattdessen wird an interessanten Stopps (z.B. Wasserfälle, Tempel, Höhlen usw.) unterwegs angehalten. 10. Es wird großer Wert darauf gelegt, die Gruppen klein zu halten, damit die Reiseteilnehmer mehr erleben können. Somit kann besser auf die individuellen Wünsche eingegangen werden.